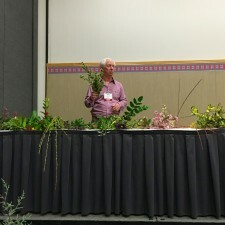 I was lucky enough to attend a seminar by Roger Gossler at Portland’s Yard, Garden, and Patio show this past weekend. Roger is an avid and generous plantsman. Gossler Farms was our very first contributing nursery on plantlust.com. 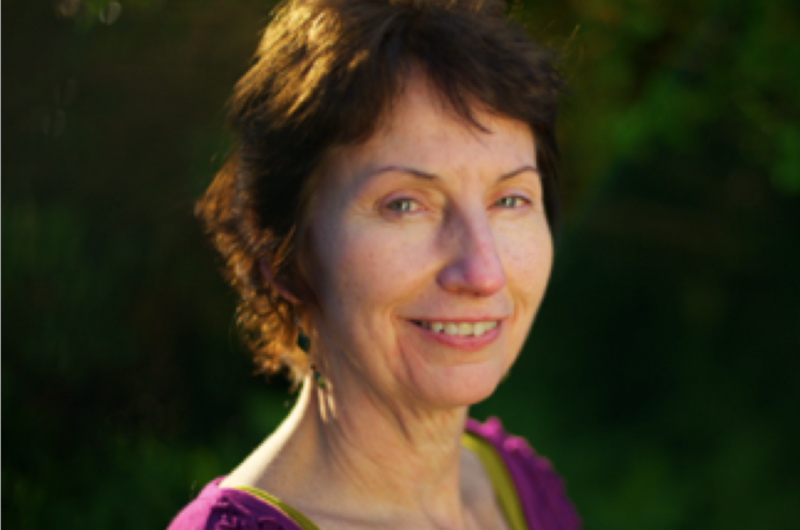 I knew we were lucky when they agreed to join us for our maiden launch, but oh my, I had no idea just how lucky. Here are a few of Roger’s suggestions. A bushy twig–i.d. escapes me. Maybe Buxus ‘Variegata’? 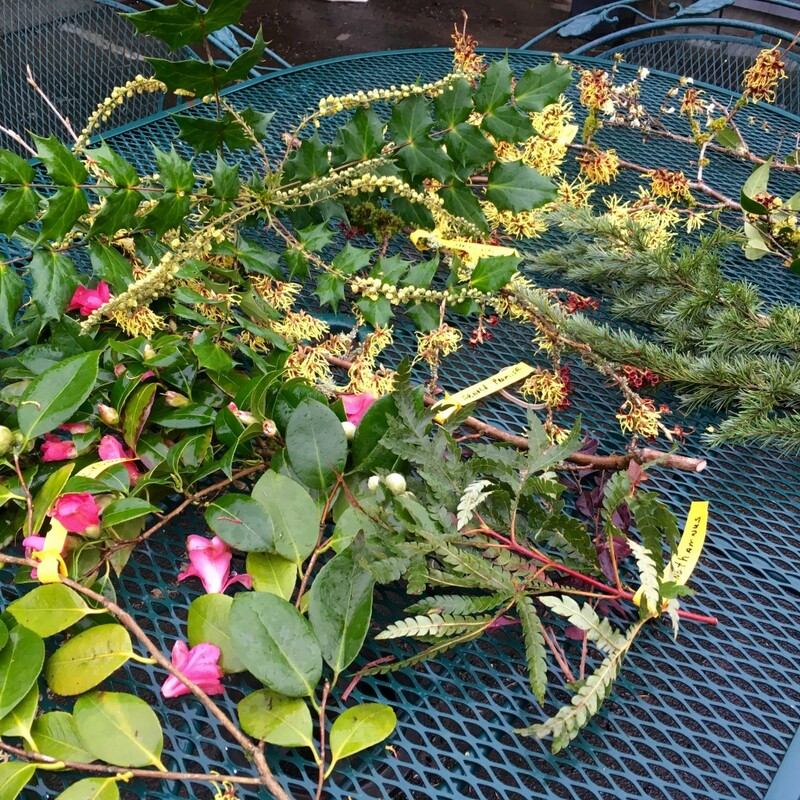 Kennedy School Gardens is a short walk from our house in the Concordia neighborhood of northeast PDX–and a good place to view great specimens. 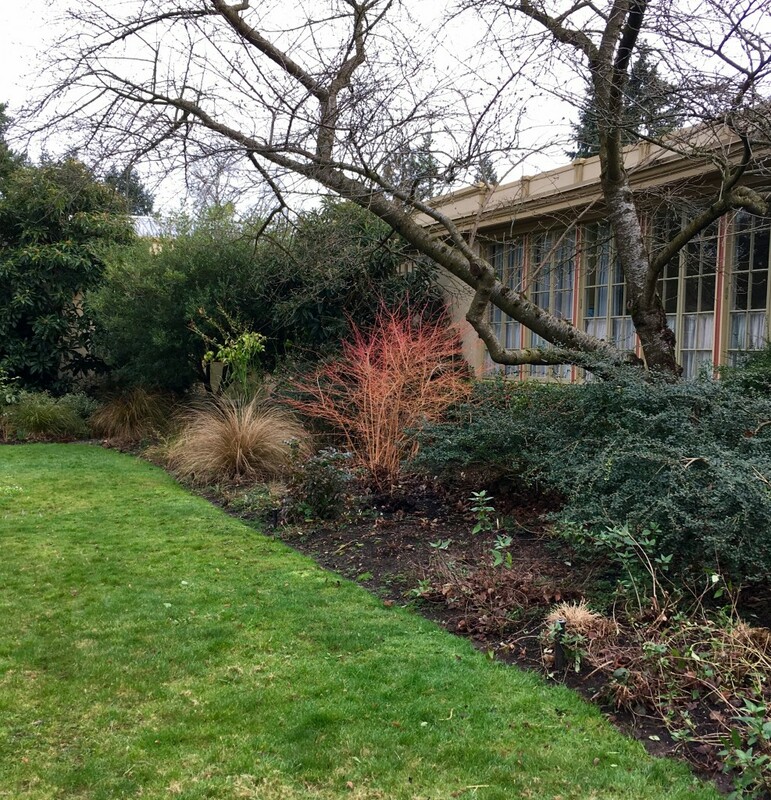 I’m guessing this is the Cornus sanguinea of which Roger spoke–a lovely focal point in the winter garden scape. 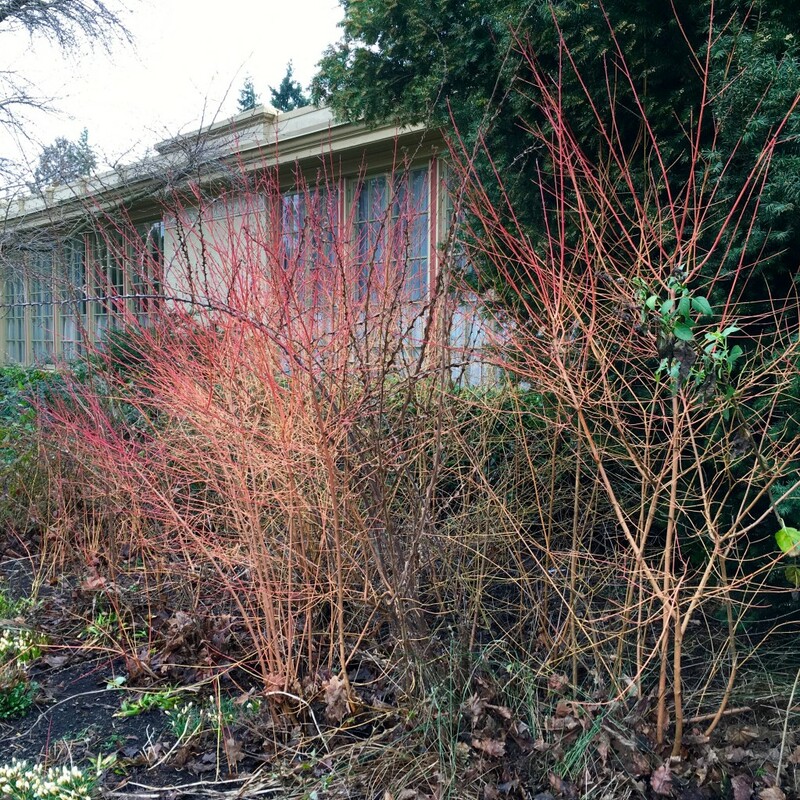 Cornus sanguinea ‘Midwinter Fire’. Draws the eye & lights up the bed. Bloodtwig Dogwoods are repeated in this bed to great effect. Multiple Bloodtwig Dogwoods are nice too, this grouping with a Wingthorn skeleton. In case you’re wondering, yes I did come away with a huge bag of Roger’s display. In my defense, he asked the audience to take them. Roger had driven from Springfield to Portland, some 110 miles, and said he had to keep his window down because of the heady scent. 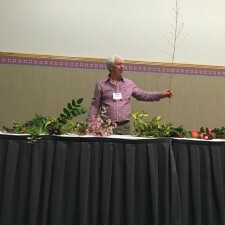 After the talk, I strolled up to collect a couple branches, and Roger started handing them over. Most people left without raiding his display, so I it was my plant lust duty to accept as many as I could carry. Thanks Roger, for these and so much more. Most of Roger’s twigs had name tags attached. Lucky me. I tried jotting down the names, but he had so many to cover in an hour’s time. 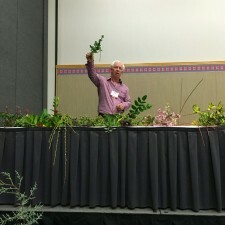 It’s fun though, isn’t it, to listen to great plant people discuss their passion. 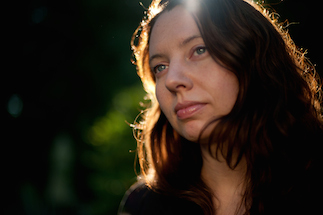 I picked up a couple pronunciations–which I can’t remember right now. But maybe I’ll be able to pull names out my hat when need be. 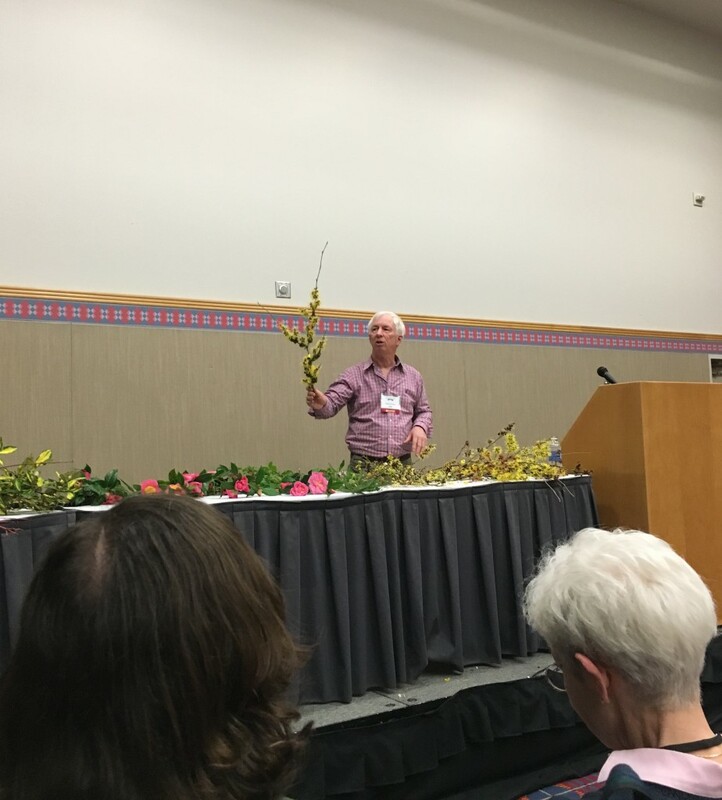 Roger holding a favorite Hamamelis aka Witch Hazel. 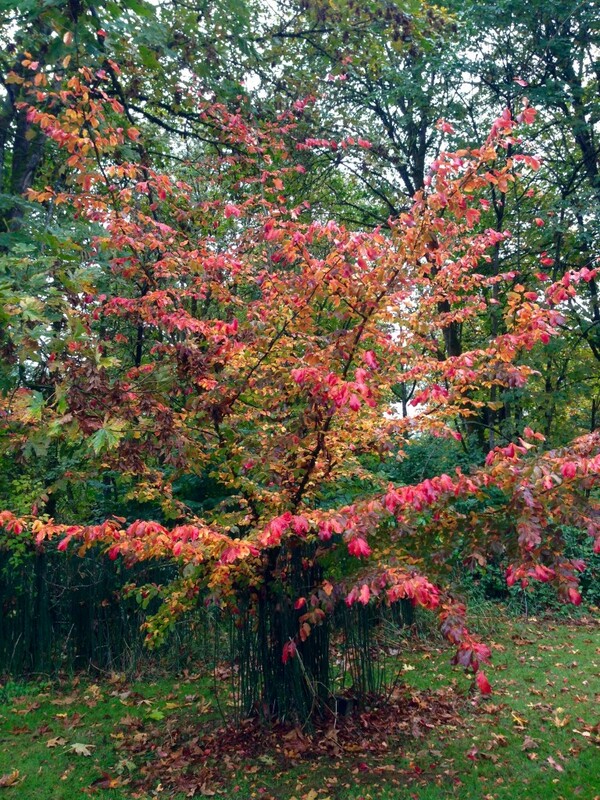 Of course, the Gosslers are famous for their Hamamelis aka Witch Hazel collection–another missing gem from my garden. Soon to be remedied. 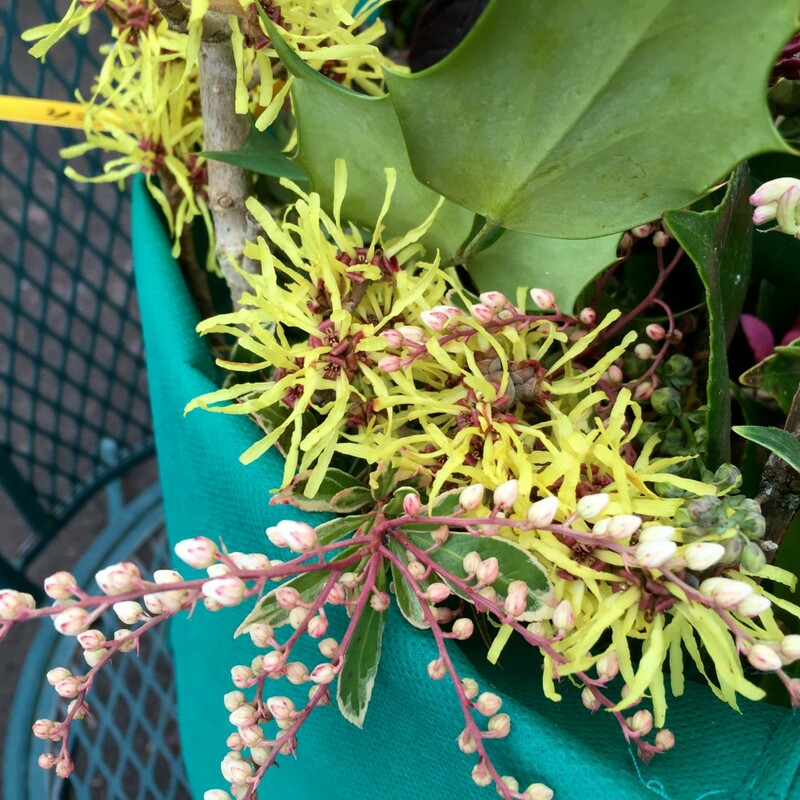 Hamamelis, Pieris, and Mahonia–in the bag. I kept losing track of which Hamamelis Roger said was his favorite–because he has a lot of “his favorites”, but I know H. Jelena was right up there in the, she-called-us-all-Babe category. 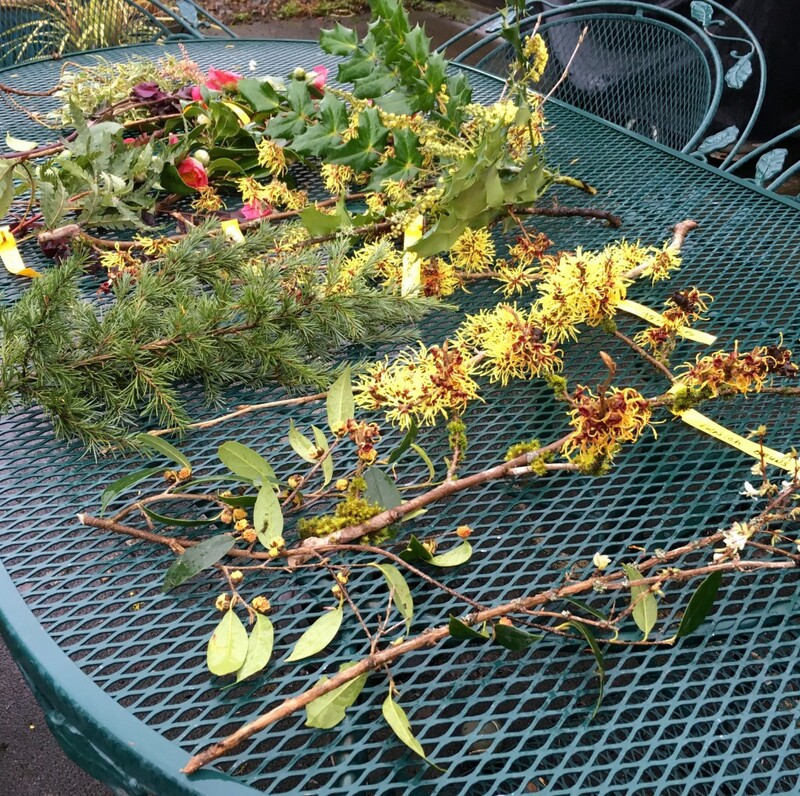 Most of the twigs had names attached. Lucky me. I don’t remember the plant below with the small yellow buds, but I wish I did. It’s cool. Hamamelis aplenty. So gorgeous, one and all. The identity of the conifer is missing from my memory bank as well. I’m weak on conifer identities. So much to learn still, and that makes me happy. No Camellias in my garden either. These are tempting, but I think I’m more inclined to dark horses. 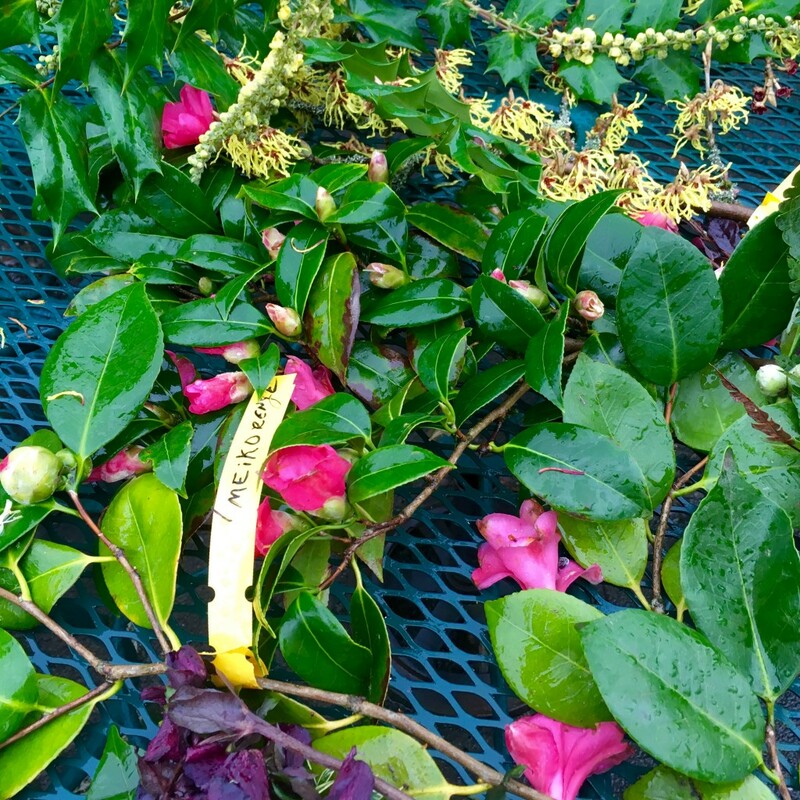 I like the look of Camellia cuspidata from Bovees Nursery here in Portland. 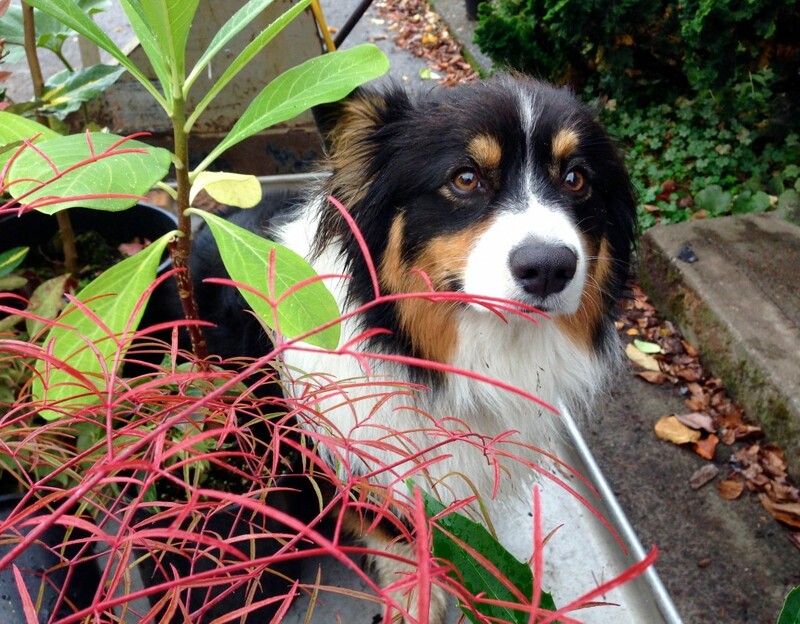 Of course, it’s sometimes hard to actually buy their plants because they love them so much–they’re a bit loathe to let them go. It’s charming, really. 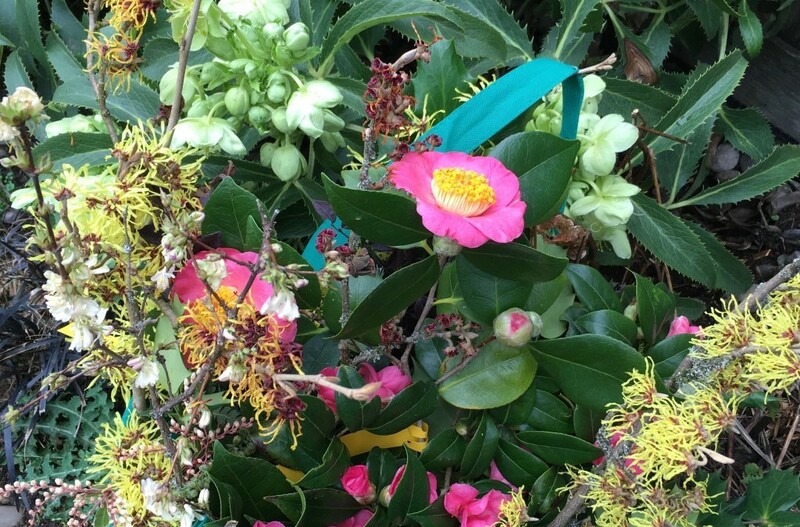 Camellia cuspidata has weeping willow-like leaves and small creamy white flowers. I like the sound of that. I should go visit them and at least get a picture. They’re okay with that. P.S. I’ve said it before: If you have the chance to visit Gossler Farms in person, do it. You’ll see gorgeous, inspiring gardens all over the property. Benny on plant deliver duty. I so wanted to bring him home with my plants.